← Great Candidate or the Greatest Candidate? 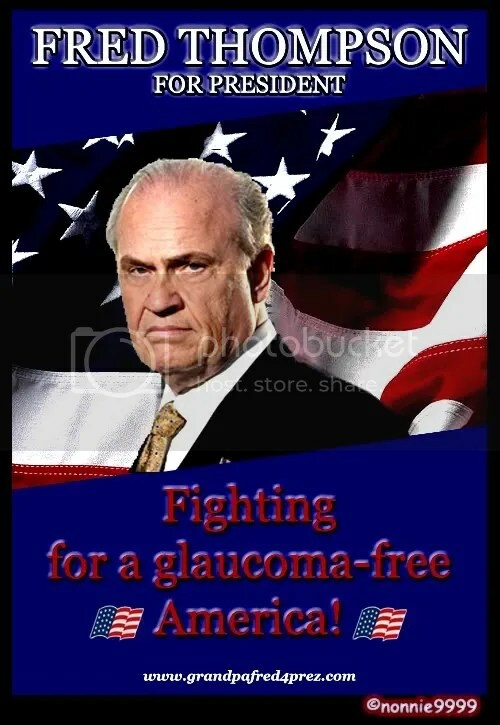 Republican presidential candidate Fred D. Thompson has been crisscrossing the country since early this summer on a private jet lent to him by a businessman and close adviser who has a criminal record for drug dealing. Thompson’s frequent flights aboard Martin’s twin-engine Cessna 560 Citation have saved him more than $100,000, because until the law changed in September, campaign-finance rules allowed presidential candidates to reimburse private jet owners for just a fraction of the true cost of flights. Well, kids, if you are looking for seed money, is there a better place to go than a guy who sells pot? In addition, was there any way that Fred might have figured out that that is how Mr. Martin made his money? Now, kids, before you start screaming about the hypocrisy of it all, consider this–what if Fred really was fully aware of Mr. Martin’s ummmmm….career path, but it figures in with his new campaign strategy to attract older voters? Martin entered a plea of guilty to the sale of 11 pounds of marijuana in 1979; the court withheld judgment pending completion of his probation. He was charged in 1983 with violating his probation and with multiple counts of felony bookmaking, cocaine trafficking and conspiracy. He pleaded no contest to the cocaine-trafficking and conspiracy charges, which stemmed from a plan to sell $30,000 worth of the drug, and was continued on probation. Thompson’s campaign said the candidate was not aware of the multiple criminal cases, for which Martin served no jail time. All are described in public court records. Archived Florida court records provide details of the various cases against Martin, including alleged sports-betting activity, a cocaine deal he arranged with an undercover sheriff’s deputy and carried out through a middleman, and the sale of 11 pounds of marijuana to an undercover detective for $3,400. Martin produced the marijuana from the trunk of his 1973 Cadillac as he and the detective were parked behind a Tampa area department store, according to the arrest report. [Martin]…started to get involved in local and [Tennessee] state politics. Rep. Zach Wamp (R-Tenn.), a close friend of both Martin and Thompson who was then a commercial real estate broker in Chattanooga, said he and Martin met through their work and became friends because of a mutual interest in Republican politics. “He always has been a mover and shaker from the first time I knew him,” Wamp said. Sorry to interrupt, but what the hell kind of name is Zach Wamp? It sounds like something that you attach to an electric guitar. Another $4,000 followed for Thompson’s 1994 Senate bid, during which a private jet owned by a wealthy Tennessee businessman, Steven A. McKenzie, flew Martin, Thompson and others around the state, according to a source with direct knowledge of the trips. From 1992 to 2002, Martin donated more than $75,000 to GOP candidates and committees, according to FEC records. By 2000, he had become a major political player in Tennessee Republican circles. For much of his work, Martin partnered with Huggins, whose in-laws played a key role in the Chattanooga area’s commercial life. McKee is the daughter of one of the area’s wealthiest residents, Ellsworth McKee. The family founded McKee Foods in 1934, and Badia McKee’s sister Debbie was the namesake of its most successful product, Little Debbie snack cakes. A pot dealer and Little Debbie’s snack cakes? Write your own joke! With Huggins’s help, and access to more than $40 million in loans and investments from the McKees and others, court records show, Martin started a series of companies. He helped run Soil Restoration and Recycling LLC, and sought public funding to help clean up Chattanooga Creek. The business ventures enabled Martin to accumulate personal wealth and allowed a company he controls, Martin International Resorts and Aviation LLC, to buy the jet used by Thompson. But some of the business ventures gave rise to litigation. But the most intractable case — one that remains unresolved — was the one brought in 2003 by his early patron, Ellsworth McKee. McKee said in court that Martin and Huggins each borrowed $8 million from him and refused to repay it. *Philip J. Martin: Here’s what we know about Martin: he is a longtime friend of Thompson, is leading the candidate’s early fundraising drive and is a successful businessman. Other than that, he’s a mystery man. I guess that’s what money can do. You get busted multiple times but never spend a day in jail, and you are known as a mystery man instead of having your information readily available to the media. Now, excuse me, I’m cranky and I need a Pecan Spinwheel. Wow, Fredrick of Hollywood has finally come up with something I could get on board with. Where do you get a ticket on a plane like that? I want to book a flight. And bring on the Little Debbie’s snack cakes, I’ll be needing those. Bong hits for patriotism!!! And let them eat cake!!!! what really surprises me is that he bought a cessna. i would have thought he would have gone for a piper or at least a boeing. That doobie-plane is incredible! Almost enought to make me take a plane ride with Fred! lol! Cool, the mile high, high. As hard as it is to believe that anyone could be a worse President than Bush, I think Ole Fred could give him a run for the money. The power behind the throne seems to be fine with letting the jester wear the crown. 😆 the mile high high! i think you are correct about grandpa fred. i think jeri would really be running things. another lady macbeth, except she would not have enough conscience for the out, out damned spot scene. Yes, Fred wouldn’t be able to pry himself out of the Bark0lounger to trouble himself with the trivial business of running the country. There would have to be many minions to take care of things, and then they’ll just give him a thick coat of lacquer before he goes on camera to play president on TV. Wow! A lot of fun here tonight! I love everyone’s comments, including nonnie’s asides. And, it’s a reefer-threefer – the plane, the cover, and the Little Debbie cakes. yes, we are a fun crowd. now, stop bogarting the doobie, and pass it over here.